For months, a few small teams of Ukiah High School STEM Club students have spent hundreds of hours after school and on weekends designing and refining underwater, remote-control robots to compete in the Northern California Regional SeaPerch competition, and on April 15, the junior team topped a competitive field of almost 40 teams from approximately 25 schools to represent Northern California at the 2018 International SeaPerch Challenge at the University of Massachusetts Dartmouth, in early June. Now they must figure out how to finance their trip. SeaPerch is an underwater robotics program that equips teachers and students with the resources they need to build an underwater Remotely Operated Vehicle (ROV) from a kit comprised of low-cost, easily accessible parts. To win the competition, students must use their knowledge of physics, engineering and mathematics to improve the “bot” (as they call it) to increase its speed and mobility as they maneuver it underwater. “The competition has three parts: the challenge course, the obstacle course and the presentation, where students share the contents of their engineering notebook and answer questions about their process for the judges,” said teacher and volunteer advisor Chatnaree Upton. 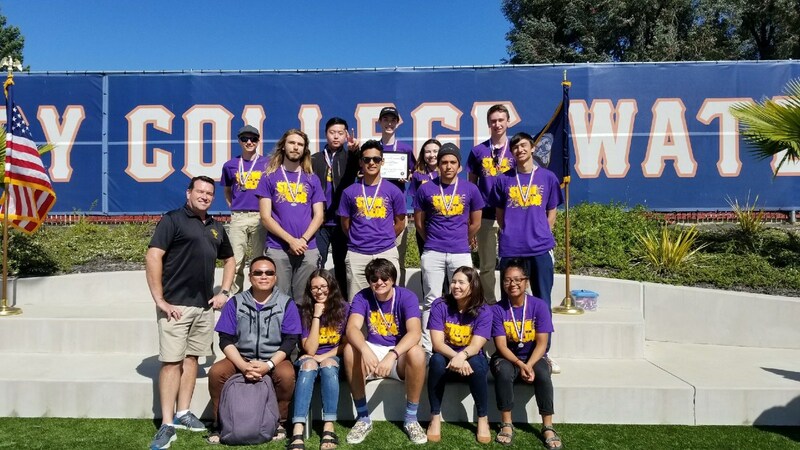 Ukiah High took two teams to the regional competition: the junior team, called team Torque (made up of mostly eleventh graders), and the senior team, team Q.U.A.N.G.O.S. (made up of mostly twelfth graders). 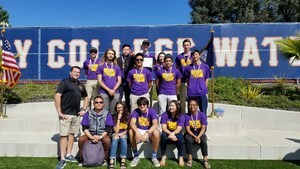 Supported by Upton and fellow teacher/advisor Edwin Kang, the students considered issues of buoyancy, balance, waterproofing, hydrodynamics, weight distribution and more, overcoming failure to get to the winning design. “We started with a design we called the Yellow Submarine, but it didn’t work,” said Sean Coursey of the junior team. It was a fully 3D-printed design that was sleek and lightweight, but it was “finicky,” according to teammate Dion Deng. After spending hours upon hours of development and testing, they realized that they needed to completely redesign the ROV. “We were sitting together in silence, depressed,” said team member Daniel Lieben. But rather than give up, the team went back to the drawing board and developed “TOTS” (The One That Survived), a pentagon-shaped, PVC-based design with 3D printed joints to allow for a narrower shape, one that made it easier to fit through obstacle course hoops. The senior team also overcame challenges, and made improvements over last-year’s design, including using a technique recommended by the Massachusetts Institute of Technology (MIT) to solder cables and then wax the motors to keep them functioning while underwater. Once the ROV designs were finalized, the teams tested their mettle against high school SeaPerch teams all over Northern California. The competition began with the challenge course in which the ROVs must be able to pick up plastic objects, then carry and place them on underwater platforms from 5 to 15 feet underwater. Each platform has a lower level and a higher, more difficult level. Senior driver Kai Maurer-Mabanglo, supported by his screaming teammates, used the remote controller to place all the objects on the platforms in just over five minutes, earning them first place overall for this part of the event. Next came the obstacle course in which teams maneuver their ROVs through underwater rings oriented vertically and horizontally. Thanks to UHS junior driver Henrik Telfer’s ability to deftly pilot the bot through the hoops, the junior team took second place overall for this part of the event. “When we were practicing, Hendrik usually drove, so we didn’t know how hard it was. Then we tried it. It’s way harder than it looks,” said Coursey. Telfer credits the team’s success to its ability to work together and use each team member’s strengths to their greatest effect. Team member Amara Saldana agreed, noting team members’ willingness to get past any disagreements for the good of the project. With a first-place finish in the presentation portion, the UHS junior team clinched their passage to the international competition June 1-3. The five students going to the 2018 International SeaPerch Challenge are Sean Coursey, Daniel Lieben, Amara Saldana, Hendrik Telfer and Dion Deng. By the end of May, they must raise $8,000 for plane tickets, lodging, meals, registration, and extra supplies. They have been selling candy and fundraising on UHS Club Days. Local Realtor Kasie Gray is helping the students with a Mendo Human Race team and, after the students returned from the regional competition, they were treated to “Lunch with a Pro,” meeting local entrepreneur and industrialist Ross Liberty of Factory Pipe. Liberty provided recommendations on how the team might refine their ROV design before the June competition, and offered to make a financial donation to help the team finance their trip. “These kids are incredible,” Liberty said. The students will be reaching out to other local businesses in hopes of additional donations. The students, in return, clearly appreciate their advisors. Daniel Ceja of the senior team said, “Ms. Upton is like an older friend who helps you. She’s smart, funny, caring and passionate.” Maurer-Mabanglo agreed, then quickly added, “Yeah, but she’s not afraid to roast you, too.” They noted that both Upton and Kang demonstrate their support and pride, though they do it in different ways. “Ms. Upton will yell and get excited with us, but Mr. Kang is more reserved. You can tell he’s into it, though,” Ceja explained. Any individuals or organizations interested in donating to the UHS SeaPerch program can make checks payable to Ukiah High School with STEM CLUB in the memo field. For questions, please contact Chatnaree Upton at cupton@uusd.net. “Any little bit helps. These kids deserve to go. They’ve worked so hard,” Upton said.